The Summer English Language and Cultural Immersion Program at Castleton University is a three-week program with an equal focus on intensive English language and cultural immersion. The program is designed for Chinese college students wishing to improve their English language proficiency and to gain a deeper understanding of U.S. culture while experiencing life on an American campus. During the program, participants attend 15 hours of classes Monday to Friday. The mornings are dedicated to focused language instruction based on the students’ English levels, while the afternoons provide opportunities for educational and cultural outings around the state of Vermont. Activities include visits to local farms and parks, exploration of historical landmarks, and other recreational and cultural sites, including the world famous Ben and Jerry’s ice cream factory. In the evenings, students participate in social activities with Castleton University students and faculty, which include a welcome bonfire, a dance party, a karaoke night, outdoor concerts and plays, and a formal farewell dinner. "We make it a point to limit the amount of class time for this program because we believe that most authentic learning occurs outside the classroom. So the time in class is dedicated to preparing them for what they are going to experience on an upcoming field trip or activity." -ELI Program Director, Erica Zimmer. Early in the program, students are divided into smaller groups, or teams, each one led by a Castleton student mentor. They remain in these teams throughout the three weeks while doing activities both on and off campus. The Castleton student mentor serves as a team captain to the Chinese students in his/her group. The mentors organize friendly competitions for the teams who compete for points that accumulate until the end of the program when the winning team is announced. One such activity is a scavenger hunt on the first day that helps the students familiarize themselves with Rutland City. The Castleton student mentors currently attend or have recently graduated from the University. As such, they know the campus inside and out, as well as the surrounding area. This enables them to serve as effective and informative guides. They also serve as conversation partners and cultural mentors to the participants. 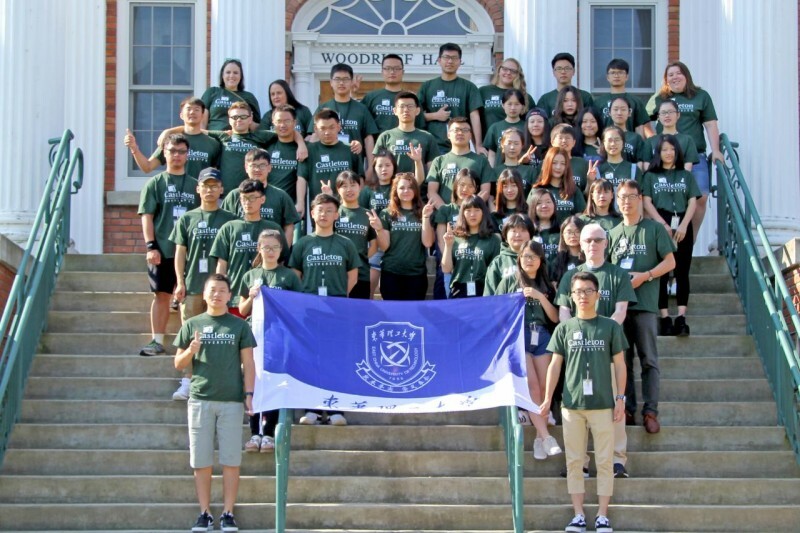 The ELI has a profound impact on these Castleton students, as evidenced by the life-long friendships that are formed with the Chinese students. After a morning of classes, students head off on field trips to explore Vermont and its beautiful environs. This is an opportunity for students to practice their newly acquired English skills and to see first-hand something they learned about in their U.S. Survey class. No two days are the same. The activities are diverse and may include a visit to a family-run farm, ice cream tasting at the Ben and Jerry’s factory, dance lessons with a professional dancer, cooking classes with a local chef, a guided tour of an American Revolutionary War battlefield, a boat cruise on Lake Champlain, a variety of musical and theatrical performances, among many other interesting and unforgettable adventures.